By Caroline Witherspoon, Becker Communications, Inc. In the summer of 2009, as part of its commitment to spread miles of smiles, Kraft Foods in Hawaii brought the OSCAR MAYER Wienermobile to the island of Oahu for the first time in 10 years. Our Hawaii-based agency, Becker Communications, Inc., was tasked with developing and implementing a strategic marketing and media relations campaign surrounding this much beloved, iconic vehicle. Frankly speaking, pun intended, it sounded like a slam-dunk. But, an unexpected surprise had us quickly treading in hot water and meeting the challenge with relish. While we were able to accomplish a lot through promotional public relations over the course of four weeks – coordination of more than 40 retailer and community stops, multiple media placements including front page stories within Hawaii’s two daily newspapers and features on all four television stations, and even a proclamation from the Mayor for OSCAR MAYER Wienermobile Day – we did encounter some opposition, which in the end, worked to our advantage. 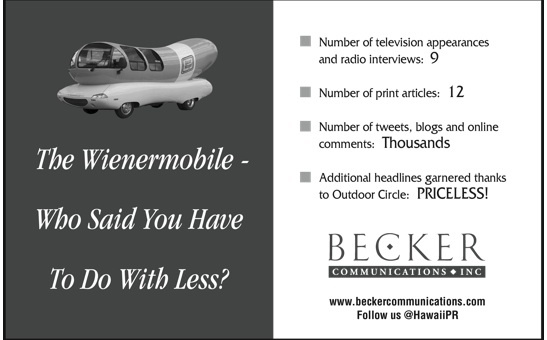 This unexpected development arose when the Outdoor Circle, a local organization with a mission to keep Hawaii clean, green and beautiful, issued a press release against the Wienermobile stating they believed it violated the law prohibiting mobile advertising vehicles in Hawaii. It is important to point out they waited to issue their release until after the Wienermobile had left our shores. We worked with Kraft corporate to develop an appropriate response and issued a statement that hit upon several key points and reinforced the brand – that to Kraft’s knowledge, they did not violate any laws; that they worked with local authorities to secure permits as necessary; and that they had a franktastic time in Hawaii. Additionally, we deployed social media and hosted a tweet-up, inviting supporters to a hot dog barbecue in the park complete with an appearance by the Hot Doggers, also known as the pilots of the Wienermobile. What could have become a heated controversy was quickly turned around, resulting in an outpouring of community support. In addition to thousands of blog posts, article comments and tweets, we even had local media providing commentary in support of the Wienermobile. And the proof was in the pudding, or hot dogs, as Kraft Foods in Hawaii ultimately recorded a 48% increase in OSCAR MAYER Wiener sales when compared to the same period the prior year. I saw the Wienermobile in Omaha last week in a parking lot shared by Panera Bread, Long John Silvers and Burger King. I think it was coming from an appearance at Rosenblatt Stadium during the College World Series. Let’s face it, an attack on the Wienermobile is just plain unAmerican! The attempt at defamation, when peeled like an oninon just smells like, well, sauerkraut! — Well, done!